All eyes are now turned to Brazil, the „country of football“, which happens to host this year’s World Cup. Weeks before the start of the tournament, international newspapers were already filling their pages with articles about Brazil’s purported many problems: inequality, poverty, criminality, corruption, and massive protests all over. Television programs also featured infrastructure deficiencies everywhere, making the audience wonder whether international football stars would get stuck on unfinished roads and airports, besides facing the poor living conditions supposedly faced by Brazilian people every day. The sunny beaches and the beautiful tropical landscape have surely also been broadcasted, contrasted with sad images from the country’s many favelas and slums. In almost all means of communications, journalists spent weeks doing political analysis just as well as they did football predictions. The questions more often asked in the weeks preceding Brazil’s World Cup were whether stadiums would be ready on time, and whether protests would perhaps impede the whistle to be blown and the games to kick-off. As the competition approaches the quarter-finals, some of the major complications reported so far seem however to have been the insects found in the hotel rooms of Uruguay’s team and the leaking of photos from Croatia’s players bathing naked in a swimming pool. The media slowly starts to change its discourse and, among compliments to the quality of the new stadiums and the hospitality of Brazilians, many say this is the best World Cup ever. In what concerns the feared perils of social agitation one should however not forget that Dutch players showing off their skills on Ipanema beach almost caused a national turmoil, especially amongst women. Nevertheless, there have been no relevant protests yet. Not even due to Brazil’s own goal in the very first match. Maybe it is now time to ask: was media coverage on Brazil somehow overstated and the protests around the World Cup much ado about nothing? On March 19th 2013, 79% of Brazilian citizens approved of the government of President Dilma Rousseff according to public opinion polls published on that day in the country’s main newspapers. In its third consecutive presidential term, the Workers’ Party (PT) was then entering its tenth year of government with an approval rate almost as high as it achieved in previous years, when former President Luis Inácio Lula da Silva seemed somehow able to please almost everyone from the lower classes to the country’s most traditional elites. Just three months later, in June 2013, hundreds of thousands of people took to the streets in Brazil’s main cities to protest. At that moment it was not quite clear what exactly they were protesting for or against. And in a way, it is somehow still not clear. Protests have been triggered in the first days of June in São Paulo due to an increase in bus fares. The government stepped back and canceled the fare hike a few days later, but violent police repression of the initial small and peaceful demonstrations seemed to have prompted more protests and more people gathered in the streets. On June 20th, simultaneous protests took place all over the country. Judging by the enormous diversity of claims and complaints written on their banners, protesters wanted above all to “come to the street” (“vem para a rua”, the protests’ definitive catchphrase), no matter why. Mainly mobilized through social networks such as Facebook, protesters criticized the rise in bus fares as much as the health and education systems, the corruption and lack of transparency, as well as the construction of stadiums for the World Cup. Hundreds of protesters’ banners contained no concrete claim at all, but vague phrases such as “the giant has awakened”, “get up from the sofa and come to the street”, “we are out of the Facebook”, and “this is not for 20 cents” (a reference to the amount of the bus fares increase). The lack of a clear political agenda made quickly room to quite anti-political acts: trade union members and supporters of political parties have been violently repelled from the demonstrations, having their t-shirts and flags ripped off by protesters. Unable to identify their own claims or to make all of them converge, protesters seemed above all to object politics as such, more than the current government or its policies. Representation and its core institutions, such as the Legislature and political parties, became the main targets of an anti-corruption rhetoric that has long been associated with the right side of the political spectrum in Brazil. Opposition parties like the right-leaning PSDB and DEM have seen the protests as an opportunity to start their campaign for the upcoming presidential election earlier and blamed the government for all possible evils. This has only been intensified by left-leaning parties such as PSTU and PSOL, who at that moment missed a chance to strengthen the left. It didn’t take long until the so-called “black blocs” – until then non-existent in the country’s history – appeared on the scene and started to destroy public buildings and smash financial institutions. More brutal repression from the police followed and soon the stage looked messy enough to become attractive to the media inside and outside Brazil. The thousands of young people and students getting involved and expressing their thoughts provided, on the other hand, an unquestionably beautiful picture of a generation that has grown up with democracy, and, different to their parents, they are now entitled to fully exercise their rights. That after 21 years of dictatorship Brazil of today has political parties to be opposed of and citizens free enough to assemble and demonstrate is already a non-negligible indication that democracy has definitively established roots in the country. But, to assume that it is the low quality of such democracy that triggered protests is as misleading as to believe that the sudden political dissatisfaction in Brazil is due to government financing the World Cup in detriment of basic public goods such as health and education – as almost all media outlets in Brazil and abroad have contended in the past months. Out of all allegations originating from the protests of June 2013 the one that seems to have lingered longer is the one accusing the government of supposedly caring more about football stadiums than about hospitals and schools. Such accusations have been so overly repeated that besides the loathing for politics expressed in the protests almost a loathing for the World Cup has evolved in the “country of football”. Ironically enough, opposition parties leaning to the left converged to the right in a movement entitled “there will be no World Cup” (não vai ter copa), a sort of expectation that things would go wrong, infra-structure and public services would break down, stadiums would not be ready on time, and the government would have no control of the emerging chaotic situation. A pernicious opposition campaign, quite disseminated in the social networks, was sadly bound to not only undermine the government but also the country itself. Pessimistic predictions have now been proven as misguided as the claims against excessive and improper use of federal resources to pay the World Cup’s bill. Considering all types of expenses incurred by all three levels of government, federal banks and private entities since 2010, the total cost of the football tournament amounts to R$25.8 billion Reais (around €8.6 billion Euros). Since 2010 Brazil has been spending annually R$280 billion (around €93.5 billion) on Education and R$206 billion (circa €68.8 billion) on Health. The total investments of all levels of Brazilian government (federal, state and municipal), banks and private sector in the World Cup taken together is therefore equivalent to only 5% of the annual public expenditure on health and education. This means that all investments in the World Cup since 2010 equal only one month of annual public expenditures on education. Even if the cost of holding the World Cup in Brazil was higher than it had initially been estimated, and despite ensuing episodes of corruption linked to FIFA, it is simply not true that the government invested in the football tournament instead of spending on education and health. Source: Transparency Portal of Brazil’s Federal Government and Folha de São Paulo Newspaper. Moreover, a World Cup’s expenses comprise not only the construction of stadiums, but also investment in transportation, airports, ports, communication and security, among others. In addition to that, the bill has not been paid by government alone; federal banks and the private sector have a share in the investments. The construction of stadiums – so criticized by protesters and misinformed by the media – was paid by states, the private sector and federal banks. No single cent from the annual federal budget has been therefore reallocated to build the sport arenas, which have cost altogether R$8 billion (circa €2.7 billion). Federal investments in stadiums have been made via loans from federal banks, most specifically the Brazilian Development Bank (BNDES), amounting to R$4 billion (about €1.3 billion). Nevertheless, the funding of stadiums’ construction and restoration is expected to return to BNDES as the loans are paid back. One should also not forget that the estimated revenue from the World Cup amounts to R$30 billion (circa €10 billion) and that investments in infrastructure, like urban mobility, was precisely one of the demands raised in the initial protests of June 2013. Even if some stadiums end up as “white elephants” in future, there is no reason to assume that the Brazilian population will not benefit from the investments in infrastructure prompted by the World Cup. If improper investments in the World Cup are not the real reason, what can explain the recent wave of protests and political dissatisfaction in Brazil? Definitely not a lack of democracy or a dysfunctioning of political institutions, and also not simply bad government performance. Over the last years Brazil has reached unforeseen levels of democratic stability and institutional consolidation. If one measures democratic quality by the level of trust in political institutions, Brazil has been scoring substantively close to many mature democracies. Regarding political representation, improvements in the electoral and party systems have been looked at in the last years along with the development of a remarkable system of participation comprising both local and national levels, which has been significantly increasing the role of citizens and civil soiety organizations (CSOs) on the formulation, implementation and monitoring of public policies. A political reform is nonetheless long-awaited, especially to implement a public financing of election campaigns, which is crucial to improve transparency and to prevent corruption. In what concerns the government’s performance, one must acknowledge that the current PT administration has not been sailing in waters as calm as former President Lula did. The “economic boom” has settled down, the economic policy has suffered some drawbacks, but nonetheless President Dilma Rousseff has been keeping the pace of the profound social changes initiated by her predecessor. And this may cause a lot of dissatisfaction among some and raise the expectations of many others. Brazil still has one of highest levels of income inequality in the world, but the country that is now hosting the World Cup is definitely no longer the same it was when its football team won the tournament last time, in 2002. Between 2003 and 2013, 37 million people have been lifted out of poverty. The Economic Commission for Latin America and the Caribbean (ECLAC) estimates that the proportion of Brazilians considered poor or extremely poor has been reduced by half only between 2005 and 2012, decreasing from 36,4% to 18,6% amongst the poor, and from 10,7% to 5,4% amongst the extremely poor. According to this United Nations’ commission, merits should be mainly given to the “Bolsa Família”, the largest conditional cash transfer program of the whole of Latin America, which currently supports over 14.1 million families in virtually each of Brazil’s 5,561 municipalities. According to the International Labour Organization (ILO), the decrease of poverty in Brazil has been directly associated with a real increase of the labor income, expansion of cash transfer and social assistance programs as well employment growth. Investments in these areas, which President Dilma Rousseff contends as the “the priority of any economic policy”, have been nonetheless upsetting those who defend that Brazil is in need of stricter fiscal policies more than anything else. The Workers’ Party government took advantage of quite a long period of economic stability to invest in social policies. Federal expenditures on education, health, social assistance and housing have been increasing considerably. According to data from the Institute for Applied Economic Research (IPEA), between 1995 and 2010 (data for 2011-2014 is not yet available), federal social spending grew from R$234 billion (circa €78 billion) in 1995 to R$638.5 billion (around €213 billion) in 2010. This growth of 172% in 16 years is also reflected on per capita federal social spending: between 1995 and 2002 it has increased 32%, while in the 2003-2010 period it has increased 70%. These data also show that the PT government has spent more per capita than the previous PSDB administration did. When federal social spending is compared with the gross domestic product (GDP) the outcome is still positive, however, not exactly noteworthy: an additional 4.3% of the GDP has been allocated for public social expenses, 2.6% of that between 2004 and 2010. Although Brazil’s GDP has been continuously increasing in the last years the share from it allocated by federal government for social expenses is rather steady. In other words, public social spending has increased without requiring a larger share of the GDP. The 37 million people who have been lifted out of poverty and entered the middle class have been benefiting from inclusive policies in all areas, in particular education, social assistance, and housing. Federal spending in education rose from R$19,7 billion (around €6.6 billion) in 1995 to R$45.5 billion (circa €15,2 billion) in 2010. 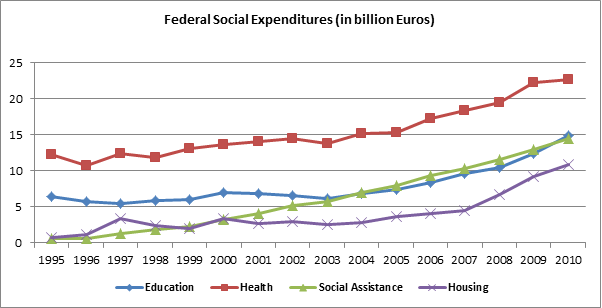 Public expenses on social assistance magnified from R$1.7 billion (about €600 million) in 1995 to R$44,2 billion (€14.7 billion) in 2010. As for public expenses on housing, although mobilizing a smaller portion of the federal budget the increase is quite remarkable: from R$2.3 billion (€780 million) in 1995 to R$33.1 (€11 billion) in 2010, a growth of 1550%. Such investment is reflected in some quite successful and comprehensive housing programs, such as the “Minha Casa, Minha Vida” (My House, My Life), which, since 2007, has allowed over 2 million Brazilian families to own a home. Brazil has still a deficit of around 5 million homes, but the situation was certainly worse before recent investments in housing policies and programs. Source: Institute for Applied Economic Research (IPEA). Large investments have also been carried out in employment policies in the last years. The share of the GIP allocated to this area has basically doubled between 1995 and 2010, and the federal government spending has triplicated, going up from R$11.1 billion (around €3.7 billion) to R$33.8 billion (circa €11.3 billion). A study by the Institute for Applied Economic Research estimates that 16 million new formal jobs have been created in Brazil between 2001 and 2011. The current administration of Dilma Rousseff has already created 4.8 million more new jobs. In addition to that, the World Cup alone allowed the creation of around 1 million extra jobs, according to the Foundation Institute of Economic Research (FIPE). Following this trend, unemployment rates decreased considerably in the last years, dropping from 12.3% in 2003 to 5.4% in 2013. While many European countries face increasing unemployment rates as a result of the economic crisis, the latter have had a minor impact in Brazil in this regard, and numbers have been falling below the two digits since 2007. Source: Brazilian Institute of Geography and Statistics (IBGE). *The rate for 2014 consists of the average of the first three months of the year. Just as Brazilians have more jobs, they also have a larger income. In the last decade, per capita income augmented 32% and if one considers the middle class alone such increase amounts to 50%. After coping with an average inflation as high as three digits in the 1980’s and earlier 1990’s, Brazil embraced in the last ten years an average inflation of 5.5%. This has allowed its new middle class, which now comprises more than half of the national population, to earn about half of the country’s purchasing power. Out of the over 108 million citizens that make up Brazil’s middle class, 68% have more schooling than their parents did and the number of those who reached university level has nearly doubled. Living in a stable democracy, enjoying economic stability, owning better employment, schooling and information, and having access to goods and services they never had before, those dozens of millions of Brazilians want, of course, more. During the halftime of the Brazil vs. Cameroon match, when the country was already winning by 2:1 and about to assure its place in the second round of the World Cup 2014, Brazil’s major television channel featured an interview with two famous former football players, both quite unhappy with the national team’s performance. Asked whether they were not being too strict and asking too much, the once prominent Casagrande answered: “We don’t want to just win. We want a spectacle”. Brazilians expect from their country as much as they expect from their football team. As political, social and economic indicators improved over the last years, citizens became more critical and their expectations increased. The protests brought about genuine claims for better infrastructure, the improvement of public services and urban renewal, as well as claims for a more efficient delivery of health care and education. The rise of expectations is definitely the fundamental cause behind recent protests in Brazil. But to believe that the wave of political dissatisfaction (sometimes expressed as a hatred for politics as such) has been precipitated solely by a more demanding middle class is to leave aside important pieces of a much more complex puzzle. Brazil’s political game has several other relevant players, some of them quite eager to reverse the Workers’ Party winning scores. Among those one finds the traditional economic elites, which have full ownership and control of the media. A few single families own almost all means of communications in the country, easily able to disseminate their views in hundreds of newspapers, television channels and radio stations throughout Brazil. It is this one-sided and biased media that the international press relies on as a source of information. It is also through such media that the right has been finding room to awaken after a long rest imposed by redemocratization. This growing “new” right seems to have an aversion to politics and politicians, and has sadly been condemning Brazil’s main political institutions. This all is not to say that Brazil is doing great, thanks for asking. There is certainly still a lot to be done. The battle against inequality is a long one. Public spending on health and education must involve a larger share of the GDP. Investments in infrastructure and public services have already proven to be urgent and the government has already realized that. The list can go further, but acknowledging what has already been done is a necessary step to keep the pace of the changes that once have made many confident that the “country of football” would become the “country of the future”. The World Cup may soon be over, but for Brazil the game has just started. Dieser Eintrag wurde veröffentlicht in Demokratiequalität, English posts, Parteien, Rechtsstaat, Ungleichheit und verschlagwortet Brazil, Demokratiequalität, Parteien, World Cup von Thamy Pogrebinschi. Permanenter Link des Eintrags.